3 Asian Development outlook supplement 3 Box 1 Outlook for the major industrial economies The pace of recovery in the major industrial economies the United States (US), the euro area, and Japan is revised down slightly from the, as a weak third quarter performance in Japan overshadows unexpected strength in the US (box table). GDP growth in the advanced economies is now forecast to average 1.4% in before picking up to 2.1% in Gross domestic product growth in the major industrial economies (%) Area Major industrial economies Actual S S United States Euro area Japan = Asian Development Outlook, S = Supplement. Note: Average growth rates are weighed by gross national income, Atlas method.. Sources: Asian Development Bank.. Asian Development Outlook. Manila; ADB estimates. The recovery in the US has been somewhat stronger than the expectations underlying the. The final growth figure for the second quarter was lifted to a seasonally adjusted annualized rate (saar) of 4.6%, and the third quarter growth estimate came up strong at 3.9%. Continued decline in the unemployment rate and strong figures for the purchasing managers index and retail sales all suggest that economic recovery in the US is maintaining its steam. With new data releases confirming a robust pace of recovery, this year s growth outlook is bumped up 0.1 percentage points to 2.2%, the same rate as in 2013, before picking up to 3.0% in The euro area recorded a saar of 0.6% in the third quarter of. This and an upward revision of second quarter growth to a saar of 0.3% mean modest expansion and relief that the euro area did not slip back into a recession. Recent indicators suggest, however, that the outlook is still subdued. Industrial production rose by a seasonally adjusted 0.6% in September, and the purchasing managers index of 51.1 foretells only mild expansion. Consumer spending also appears to be weak, as retail sales gained only 0.4% in October. The consumer confidence index declined further in November. The unemployment rate remained at 11.5% in October, unchanged for 3 months. The risk of deflation persists as the inflation rate remains close to zero. The harmonized index of consumer prices increased from 0.3% to 0.4% in October, but it languishes well below the central bank s inflation target of 1.0%. The assumptions underlying euro area growth projections that the recovery has not built momentum and that downside risks are great are unchanged from the. The growth forecasts of 0.8% for and 1.0% for 2015 are maintained. 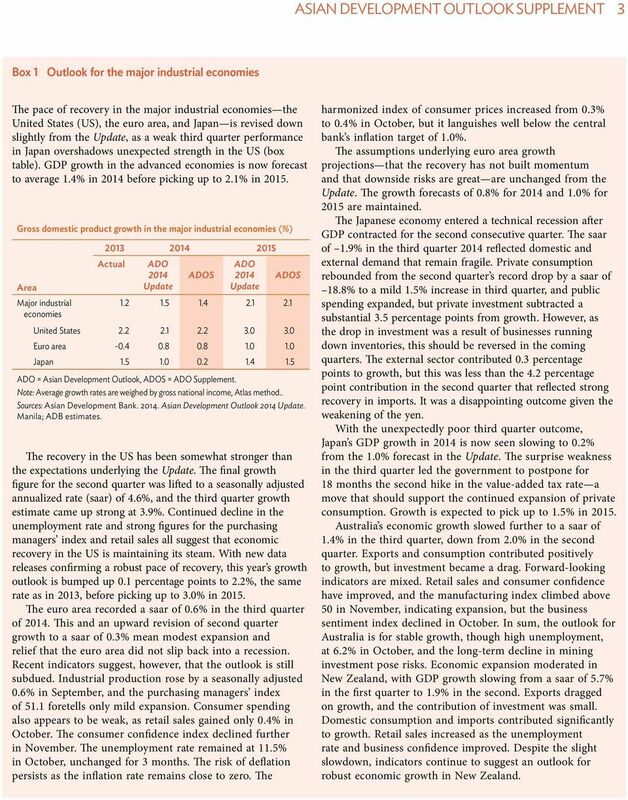 The Japanese economy entered a technical recession after GDP contracted for the second consecutive quarter. The saar of 1.9% in the third quarter reflected domestic and external demand that remain fragile. Private consumption rebounded from the second quarter s record drop by a saar of 18.8% to a mild 1.5% increase in third quarter, and public spending expanded, but private investment subtracted a substantial 3.5 percentage points from growth. However, as the drop in investment was a result of businesses running down inventories, this should be reversed in the coming quarters. The external sector contributed 0.3 percentage points to growth, but this was less than the 4.2 percentage point contribution in the second quarter that reflected strong recovery in imports. It was a disappointing outcome given the weakening of the yen. With the unexpectedly poor third quarter outcome, Japan s GDP growth in is now seen slowing to 0.2% from the 1.0% forecast in the. The surprise weakness in the third quarter led the government to postpone for 18 months the second hike in the value-added tax rate a move that should support the continued expansion of private consumption. Growth is expected to pick up to 1.5% in Australia s economic growth slowed further to a saar of 1.4% in the third quarter, down from 2.0% in the second quarter. Exports and consumption contributed positively to growth, but investment became a drag. Forward-looking indicators are mixed. Retail sales and consumer confidence have improved, and the manufacturing index climbed above 50 in November, indicating expansion, but the business sentiment index declined in October. In sum, the outlook for Australia is for stable growth, though high unemployment, at 6.2% in October, and the long-term decline in mining investment pose risks. Economic expansion moderated in New Zealand, with GDP growth slowing from a saar of 5.7% in the first quarter to 1.9% in the second. Exports dragged on growth, and the contribution of investment was small. Domestic consumption and imports contributed significantly to growth. Retail sales increased as the unemployment rate and business confidence improved. Despite the slight slowdown, indicators continue to suggest an outlook for robust economic growth in New Zealand. 4 4 Asian Development outlook supplement expenditure in the first half of may push the government to tighten fiscal policy to meet its fiscal targets, perhaps dampening growth. 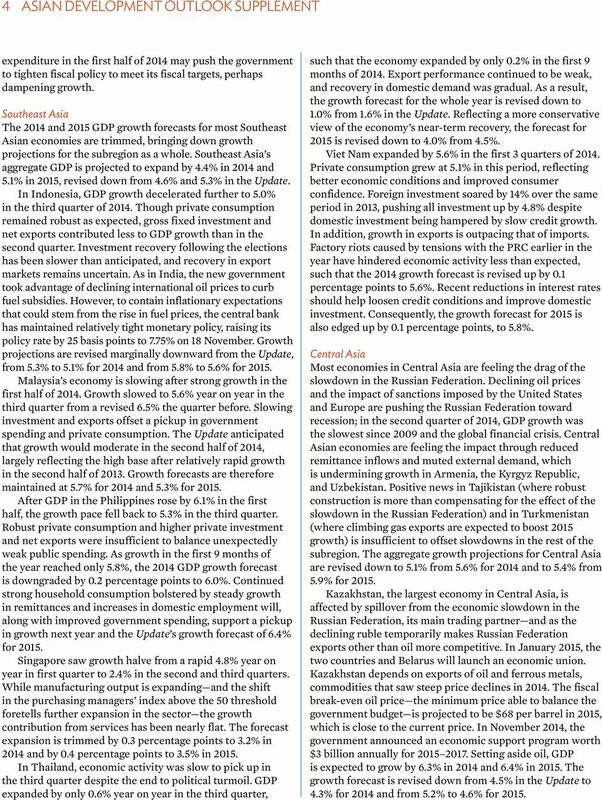 Southeast Asia The and 2015 GDP growth forecasts for most Southeast Asian economies are trimmed, bringing down growth projections for the subregion as a whole. 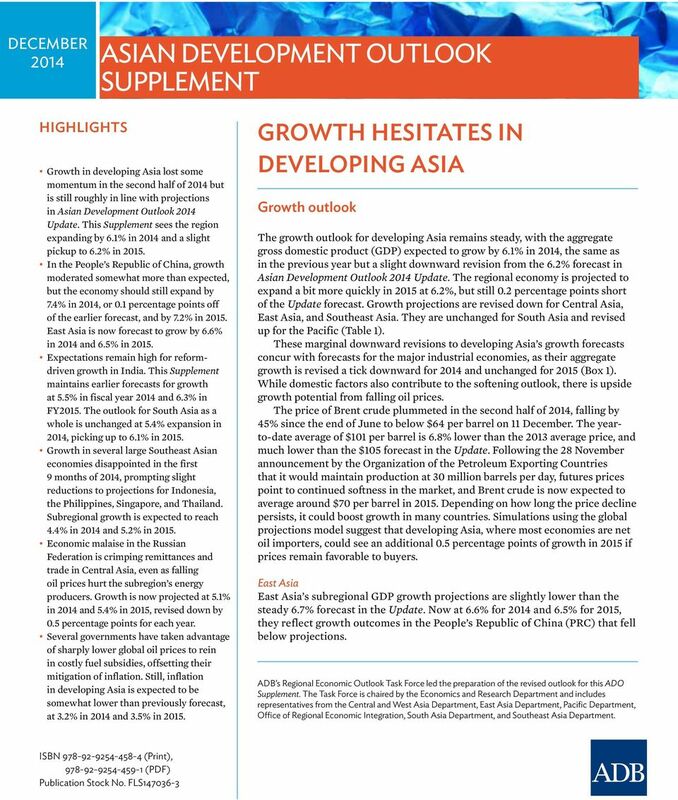 Southeast Asia s aggregate GDP is projected to expand by 4.4% in and 5.1% in 2015, revised down from 4.6% and 5.3% in the. In Indonesia, GDP growth decelerated further to 5.0% in the third quarter of. Though private consumption remained robust as expected, gross fixed investment and net exports contributed less to GDP growth than in the second quarter. Investment recovery following the elections has been slower than anticipated, and recovery in export markets remains uncertain. As in India, the new government took advantage of declining international oil prices to curb fuel subsidies. However, to contain inflationary expectations that could stem from the rise in fuel prices, the central bank has maintained relatively tight monetary policy, raising its policy rate by 25 basis points to 7.75% on 18 November. Growth projections are revised marginally downward from the, from 5.3% to 5.1% for and from 5.8% to 5.6% for Malaysia s economy is slowing after strong growth in the first half of. Growth slowed to 5.6% year on year in the third quarter from a revised 6.5% the quarter before. Slowing investment and exports offset a pickup in government spending and private consumption. The anticipated that growth would moderate in the second half of, largely reflecting the high base after relatively rapid growth in the second half of Growth forecasts are therefore maintained at 5.7% for and 5.3% for After GDP in the Philippines rose by 6.1% in the first half, the growth pace fell back to 5.3% in the third quarter. Robust private consumption and higher private investment and net exports were insufficient to balance unexpectedly weak public spending. As growth in the first 9 months of the year reached only 5.8%, the GDP growth forecast is downgraded by 0.2 percentage points to 6.0%. 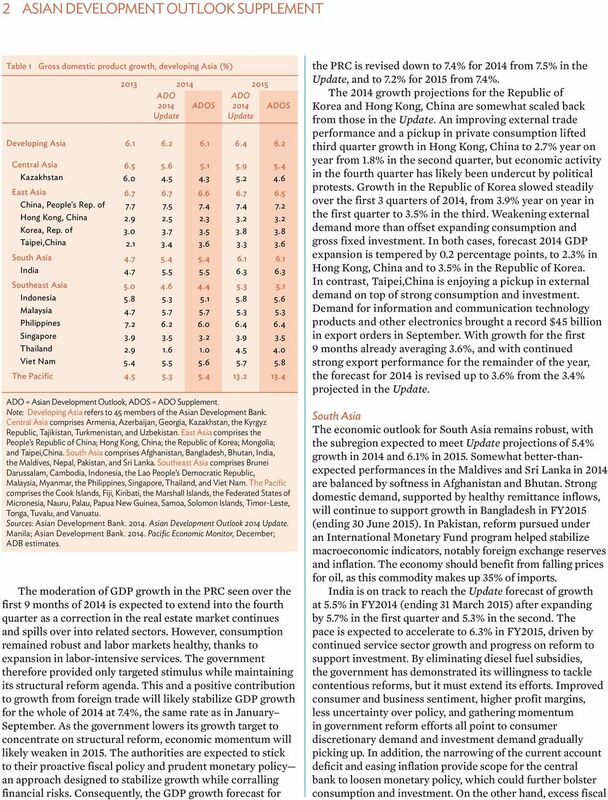 Continued strong household consumption bolstered by steady growth in remittances and increases in domestic employment will, along with improved government spending, support a pickup in growth next year and the s growth forecast of 6.4% for Singapore saw growth halve from a rapid 4.8% year on year in first quarter to 2.4% in the second and third quarters. While manufacturing output is expanding and the shift in the purchasing managers index above the 50 threshold foretells further expansion in the sector the growth contribution from services has been nearly flat. The forecast expansion is trimmed by 0.3 percentage points to 3.2% in and by 0.4 percentage points to 3.5% in In Thailand, economic activity was slow to pick up in the third quarter despite the end to political turmoil. GDP expanded by only 0.6% year on year in the third quarter, such that the economy expanded by only 0.2% in the first 9 months of. Export performance continued to be weak, and recovery in domestic demand was gradual. As a result, the growth forecast for the whole year is revised down to 1.0% from 1.6% in the. Reflecting a more conservative view of the economy s near-term recovery, the forecast for 2015 is revised down to 4.0% from 4.5%. Viet Nam expanded by 5.6% in the first 3 quarters of. Private consumption grew at 5.1% in this period, reflecting better economic conditions and improved consumer confidence. Foreign investment soared by 14% over the same period in 2013, pushing all investment up by 4.8% despite domestic investment being hampered by slow credit growth. In addition, growth in exports is outpacing that of imports. Factory riots caused by tensions with the PRC earlier in the year have hindered economic activity less than expected, such that the growth forecast is revised up by 0.1 percentage points to 5.6%. Recent reductions in interest rates should help loosen credit conditions and improve domestic investment. Consequently, the growth forecast for 2015 is also edged up by 0.1 percentage points, to 5.8%. Central Asia Most economies in Central Asia are feeling the drag of the slowdown in the Russian Federation. Declining oil prices and the impact of sanctions imposed by the United States and Europe are pushing the Russian Federation toward recession; in the second quarter of, GDP growth was the slowest since 2009 and the global financial crisis. Central Asian economies are feeling the impact through reduced remittance inflows and muted external demand, which is undermining growth in Armenia, the Kyrgyz Republic, and Uzbekistan. Positive news in Tajikistan (where robust construction is more than compensating for the effect of the slowdown in the Russian Federation) and in Turkmenistan (where climbing gas exports are expected to boost 2015 growth) is insufficient to offset slowdowns in the rest of the subregion. The aggregate growth projections for Central Asia are revised down to 5.1% from 5.6% for and to 5.4% from 5.9% for Kazakhstan, the largest economy in Central Asia, is affected by spillover from the economic slowdown in the Russian Federation, its main trading partner and as the declining ruble temporarily makes Russian Federation exports other than oil more competitive. In January 2015, the two countries and Belarus will launch an economic union. Kazakhstan depends on exports of oil and ferrous metals, commodities that saw steep price declines in. The fiscal break-even oil price the minimum price able to balance the government budget is projected to be $68 per barrel in 2015, which is close to the current price. In November, the government announced an economic support program worth $3 billion annually for Setting aside oil, GDP is expected to grow by 6.3% in and 6.4% in The growth forecast is revised down from 4.5% in the to 4.3% for and from 5.2% to 4.6% for 2015. 6 6 Asian Development outlook supplement accelerated by 0.6 percentage points to 6.4% as electricity tariffs were raised and fuel subsidies were reduced, and as unfavorable weather pushed up food prices. The effect of higher administered prices on inflation is expected to be short-lived, however, and the rate should taper toward the end of In Malaysia, inflation rose marginally from 3.2% in July to 3.3% in August, the highest in 2 years. The producer price index recorded slower growth in the third quarter, at 0.9% year on year, on account of lower global prices for minerals, fuels, and lubricants. Inflation is likely to accelerate as the fuel subsidy is reduced in October and a tax on goods and services is implemented in April. The inflation forecasts of 3.3% for and 3.6% for 2015 are retained. In Central Asia, the subregional inflation forecast is revised down in line with easing in Azerbaijan and Kazakhstan, which more than offsets surprisingly strong price pressures in the Kyrgyz Republic and Tajikistan and stable inflation elsewhere. Inflation projections are now 6.8% for, down from 7.6% in the, and 6.8% for 2015, down from 7.0%. 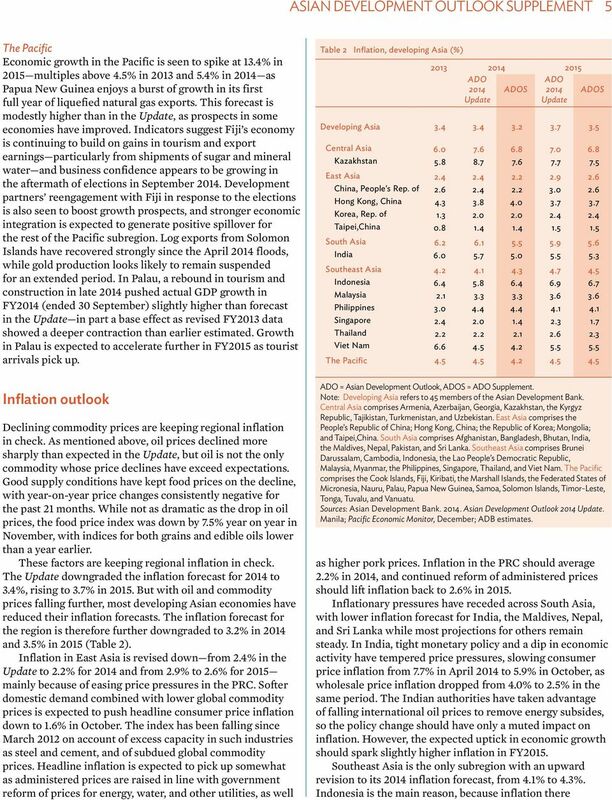 Inflation in the Pacific subregion is projected to ease from 4.5% in 2013 to 4.2% in as global commodity prices decline and inflationary pressures in Fiji moderate. Increased consumption and higher tobacco taxes and medical and educational fees in Palau have brought higher inflation, which is expected to continue through next year. 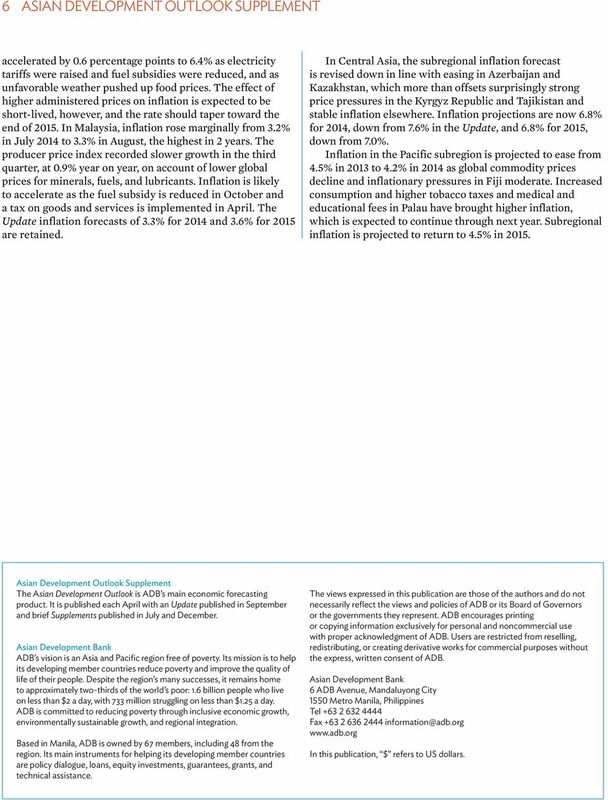 Subregional inflation is projected to return to 4.5% in Asian Development Outlook Supplement The Asian Development Outlook is ADB s main economic forecasting product. It is published each April with an published in September and brief Supplements published in July and December. Asian Development Bank ADB s vision is an Asia and Pacific region free of poverty. Its mission is to help its developing member countries reduce poverty and improve the quality of life of their people. Despite the region s many successes, it remains home to approximately two-thirds of the world s poor: 1.6 billion people who live on less than $2 a day, with 733 million struggling on less than $1.25 a day. ADB is committed to reducing poverty through inclusive economic growth, environmentally sustainable growth, and regional integration. Based in Manila, ADB is owned by 67 members, including 48 from the region. Its main instruments for helping its developing member countries are policy dialogue, loans, equity investments, guarantees, grants, and technical assistance. The views expressed in this publication are those of the authors and do not necessarily reflect the views and policies of ADB or its Board of Governors or the governments they represent. ADB encourages printing or copying information exclusively for personal and noncommercial use with proper acknowledgment of ADB. Users are restricted from reselling, redistributing, or creating derivative works for commercial purposes without the express, written consent of ADB. Asian Development Bank 6 ADB Avenue, Mandaluyong City 1550 Metro Manila, Philippines Tel Fax In this publication, $ refers to US dollars. Chapter I Major trends in the world economy This chapter is an overview of the current situation of the world economy. It also offers an analysis of the growth of and challenges for the Chinese economy. Investment Insights 2012 First Quarter Equity Market Review By William Riegel, Head of Equity Investments After a volatile year in 2011, equity markets grew more confident in the first quarter of 2012.